Royal Caribbean Cruises Ltd. is a global cruise vacation company that operates Royal Caribbean International, Celebrity Cruises, Pullmantur and Azamara Cruises. The company has a combined total of 35 ships in service and seven under construction. It also offers unique land-tour vacations in Alaska, Asia, Australia, Canada, Europe, Latin America and New Zealand.Since the company was founded in 1968, Royal Caribbean Cruises Ltd. has become a mainstay in the travel world. Based in Miami, Florida, the company is known for setting the standard in cruise vacations with its innovative onboard amenities. As part of its marketing efforts, Royal Caribbean Cruises Ltd. supports a network of several thousand travel agencies and affiliates around the world. These agencies and affiliates are responsible for promoting and booking vacation packages across the cruise line’s four business units. To support their advertising and marketing needs, Royal Caribbean Cruises Ltd. implemented a digital asset management (DAM) system that cataloged photography and video that can be used by its agencies and affiliates to develop their marketing and promotional communications. This system provided a means to ensure consistency of the company’s brands. While this system helped to centralize the latest marketing assets, Royal Caribbean Cruises Ltd. realized the need to add new capabilities in order to support its international growth initiatives. This led to the decision to implement a new DAM solution that could provide greater flexibility for users and support for a broader range of assets. Royal Caribbean Cruises Ltd. enlisted its agency – Arnold Worldwide – to recommend a new DAM strategy, and identify other technology options that would better suit the needs of its network of agencies and affiliates. Arnold Worldwide sought industry expertise to support the DAM selection process. Their search brought them to DPCI, an interactive agency based in New York City that delivers integrated technology solutions for organizations that need to deliver information and content across a range of channels. In addition to DAM, the company designs and implements Web content management and portal systems, multi-channel systems, and editorial workflow management solutions. “DPCI not only understood our client’s needs, but more importantly helped frame the entire DAM strategy that ultimately guided the RFP and vendor selection process,” explained Sarah Cambria, Account Supervisor at Arnold Worldwide. As part of the process, all responses from the original RFP were sent to DPCI for analysis. Upon receipt of the 10 submissions, it was clear to DPCI that a direct comparison of all solutions and their respective capabilities was not going to be an easy task, considering the different ways in which each vendor responded to the RFP. Their responses contained technical jargon, information that was difficult to interpret, and several were very long and verbose. Given the complexity of the submissions and responses, DPCI employed their proprietary vendor analysis methodology. Working together, DPCI and Arnold Worldwide developed a blueprint for Royal Caribbean Cruises Ltd.’s DAM processes as well as the needs of its agents and affiliates. The current system cataloged thousands of photographs, logos, video clips, advertising templates, and other corporate marketing materials, but could be challenging to navigate. The new system needed to be intuitive, giving users a range of tools to search and find relevant digital assets quickly. As a follow-up to the initial RFP, DPCI created a series of work sheets that were sent back to all the participating vendors. These work sheets were instrumental in helping normalize each vendor’s capabilities in order to conduct direct comparisons on the features and functionality that were most important to Royal Caribbean Cruises Ltd. This information was then compiled and rated, eliminating some vendors that did not match specific criteria, and revealing the strengths and weaknesses of the remaining participants. After the list was pared down from 10 hopefuls to three vendors, each was invited to meet with Royal Caribbean Cruises Ltd., the agency and DPCI in order to present their solutions. Direction was given in regards to specific functionality that Royal Caribbean Cruises Ltd. required, so that the vendors could showcase exactly how their system would meet the client’s needs. This meeting also provided an opportunity for each vendor to demonstrate other unique features that would differentiate them from the others. After meetings and demonstrations with all three vendors and their solutions, DPCI and Arnold Worldwide were well-positioned to steer Royal Caribbean Cruises Ltd. toward the one DAM technology that best fits its needs today and tomorrow. 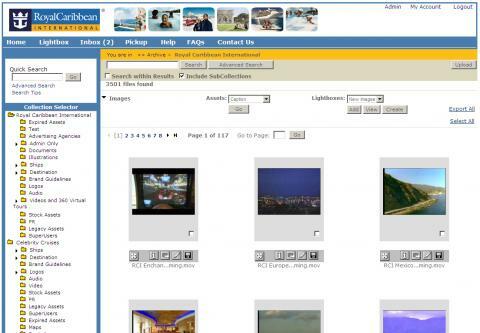 Editors Note: At the time of this printing, Royal Caribbean Cruises Ltd. identified the appropriate digital asset management vendor, and plans to formally make an announcement in 3Q 2007.